Boon is one of Thailand’s fastest growing combat sport brands. This little known Thai company is something of a rarity here in the United States, but they have quite the reputation when it comes to making affordable, quality, “less flashy” gear which gets the job done and withstands the rigors of training in the hot Thai heat. They are a provider of shin guards, Thai shorts, focus mitts, belly pads, and headgear. Their most sought after piece of gear are definitely their Muay Thai Velcro boxing gloves though. Boon Boxing gloves are by far the most comfortable piece of gear I’ve bought to use for training, and not just in terms of boxing gloves. If you’re looking for an all-around great glove, then you should definitely pick up a pair of Boon’s and give them a try as you definitely won’t be disappointed. They work well as either a bag glove, for pad work, or sparring with enough padding and wrist support to keep you hitting for days. I have received numerous compliments about these gloves by others who have tried them on and I’m sure you will too if you give them a try. 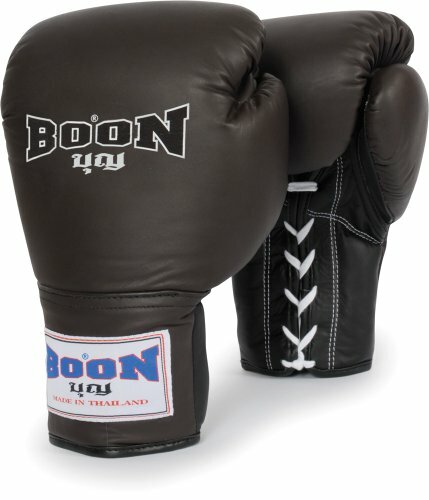 Jhullian purchased this pair of Boon boxing gloves himself for the full price. This did not influence the outcome of this review.